Cinderella’s powers will destroy the Kingdom of Fantasia, and the only one who can save the kingdom is her “wicked” stepmother. When Lady Angelique put her second husband to rest, she tried to do right by her step-daughter Eleonore. After Eleonore’s mystical abilities put Angelique’s own daughters’ lives at risk, she makes the difficult decision to lock the girl in the tower to keep the family safe. After Eleonore’s devil-bird minions unleash her on an unsuspecting royal ball, Angelique must join forces with the king to save Fantasia before Eleonore destroys it. 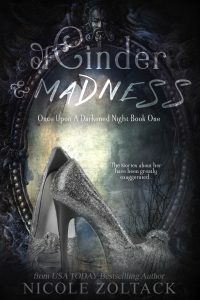 Of Cinder and Madness also includes the short stories The Cost of Love, The Cost of Grief, and The Cost of Power.